Human-Aware Intelligent Systems, that interact naturally with a human-inhabited environment, represent the next frontier of information technology. They extract information related to humans and their activities from sensor data, perform decision making, and act to make human living more safe, comfortable and entertaining. I am particularly interested in the perception and modeling component of such intelligent systems, with applications to intelligent vehicles and smart surveillance. Our long-standing effort is directed towards a system for real-time detection and tracking of pedestrians from a moving vehicle. The current stereo vision system combines pedestrian detection, trajectory estimation, risk assessment and driver warning or vehicle braking. FROG proposes to develop a guide robot with a fun personality and behaviours that will engage tourists in a fun exploration of outdoor attractions. The UvA is responsible for stereo-based person detection and body facing direction estimation in people groups. Whereas CASSANDRA (see past projects) considered only aggressive behaviour, the scope is enlarged in ADABTS to detect all kinds of abnormal behaviour, as resulting from threats of terrorism, crime, and riots. Consequently, both supervised and unsupervised learning frameworks are considered. A further extension is that ADABTS looks at larger groups of people. See Functionalities and Applications presentation at the ADABTS end-user workshop on 25-06-2013 in The Hague, The Netherlands. See photo. Automatic 3D human pose and shape estimation by a three-step procedure: first, recover initial poses over a sequence using an initial (generic) body model. Both model and poses then serve as input to an adaptation process based on frame selection and shape-texture optimization. Finally, a more accurate pose recovery is obtained by means of the adapted model. We introduced a framework for unconstrained 3D human upper body pose estimation from multiple camera views in complex environment. Its main novelty involved the integration of three components: single-frame pose recovery, temporal integration and model texture adaptation. UvA 3D human pose recovery dataset. The dataset, provided by the University of Amsterdam, contains 3 calibrated, frame-synchronised video streams from challenging, outdoor environment (train station platform). This project pursues human activity recognition in dynamic environments, in particular, automatic aggression detection. Because events associated with the buildup or enactment of aggression are difficult to detect by a single sensor modality (e.g. shouting versus hitting-someone), CASSANDRA combines audio- and video-sensing. I worked a number of years on generic shape-based object detection based on hierarchical matching with distance transforms. The method was successfully applied in a variety of application domains ranging from intelligent vehicles to industrial inspection. This work involves a spatio-temporal object representation termed Dynamic Point Distribution Models (DPDMs) which can deal with both continuous and discontinuous appearance changes and is learned automatically from training data. State propagation is achieved using a particle filter which integrates shape, texture and depth information. See Trans. on ITS’08 article and videoclip. 2003-2005, University of Amsterdam, The Netherlands. With recent hardware advances, dense stereo algorithms have become feasible for real-time implementation on general-purpose processors. We developed a framework of such algorithms based on a SIMD architecture and examined their performance-speed trade-offs. See Trans. on ITS’06 article. 1993-1996, University of Maryland, USA. First system for the vision-based 3D tracking of unconstrained whole-body movement, of that time. Using four cameras, the system recovered 3D body pose without requiring the human to wear special markers, as was (and still is) the norm in motion capture. 1996, MIT Media Lab, USA. 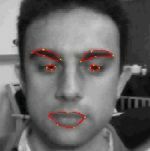 During my semester-long visit at the MIT Media Lab I worked on a “poor man’s Cyberware scanner”: a system that uses a single video-camera to create from a sequence of a user turning his head a realistic textured 3D head model. 1995-1996, University of Maryland, USA. This research introduces the Hermite contour representation for deformable shape tracking. It combines a maximum-a-posteriori criterion for the energy function with a dynamical programming technique to find optimal solution of the resulting minimization problem. USC Computer Vision and Pattern Recognition Conferences: List of upcoming conferences, maintained by Keith Price. USC Annotated Computer Vision Bibliography: great site for literature search. Maintained by Keith Price. CVOnline: On-line collection of hypertext summaries on the central topics in computer vision. Index contains more than 700 topics. Copyright © 2001-2013 Gavrila. All rights reserved. Disclaimer.